This psychedelic image of the sun from NASA's Solar Dynamics Observatory is actually two pictures combined, both taken on July 12. It's also one of National Geographic News's favourite recent space images. By superimposing an extreme-ultraviolet image of arcing solar material on a "magnetogram" showing magnetic fields, scientists created a complex picture of an active region just before it unleashed a powerful solar flare. 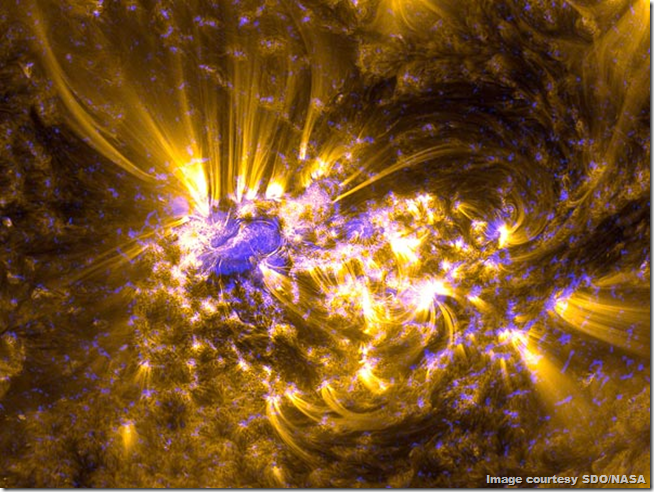 According to NASA, such composite images help scientists better understand the origins and causes of the flares.